1. Waking up Christmas morning with kids who ate breakfast and participated in our Advent lesson without asking about presents. Even when we started opening presents, the kids were patient to wait their turn to open each gift. It made Christmas morning so enjoyable. Julian did get a little impatient when Uncle Alex walked in and handed him his gift. I took the gift from him and told him to wait until everyone was ready, but Julian's eyes and hands kept wandering over to the gift that was clearly intended for him! 2. 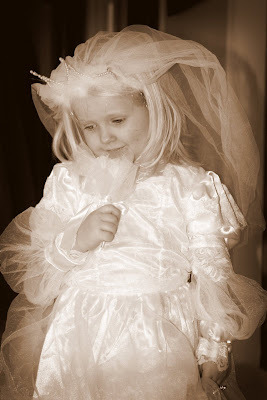 Gasping when D'arcy came out in her wedding gown. 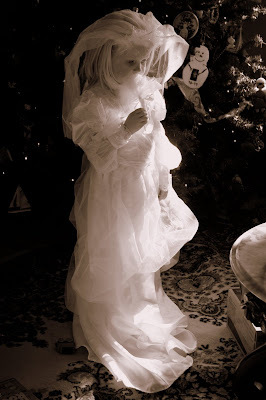 This dress came from Cracker Barrel and came complete with veil, bouquet, and a garter that Dad just couldn't bring himself to help her put on. 3. Watching Julian and his cousin Gabe play trains together. Gabe is only three weeks older than D'arcy so in the past they have played and Julian has sort of tagged along. This year, though, Julian and Gabe found they had common interests (aka Thomas and Lightning McQueen) so they played while D'arcy walked around as a princess with her newborn baby doll. 4. Taking the kids to see the Polar Express in 3D at the IMAX. Julian put on his glasses, sat in his own seat, and watched the whole movie very intently. The picture of him sitting in his theater seat that wouldn't stay down without the help of Uncle Josh with his little plaid jacket and red 3D glasses will stick with me for a long time. 5. Playing games with our family (Even Dianne & Emmett...gasp!). I received Apples to Apples, Trigon Blockus, and Phase 10 for Christmas which all got lots of use (Thanks Emily & Kyle!). We also enjoyed playing Wii golf and Wii Fit. Stephen doing yoga poses was great entertainment. At one point towards the end of our trip, I told Stephen that I was gamed out which he thought was funny because I'm always hounding him to play games. 6. Seeing my old friends from high school. One who I hadn't seen since her wedding in '03 and who hadn't met my kids, one who just bought a very cute house, and one who is opening her own Bakery in Indy (Indy Cakes on 135 & Epler). 7. Making gingerbread houses with D'arcy, Julian, Gabe, and Ella. The unique thing about this event was that my parents invited Stephen's parents over AND Gabe's other grandparents over for pizza and watching the kids construct their own houses. I think its pretty cool all three sets of grandparents get along and can share in an event like this. 8. Seeing my brother's new house and Stephen's parents new house. Both of which are really lovely. Stephen and his brother spent the last Christmas in their childhood home which was sort of sad. 9. 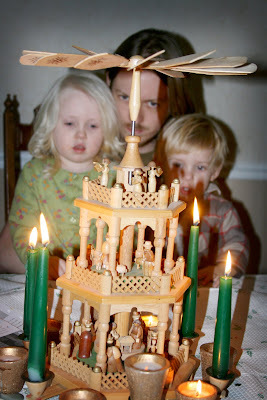 Watching the Stephen and the kids try to get this German Christmas decoration to spin from the heat of the candles below it. The kids had been asking about it all week, and after a half hour we did get it to spin! 10. Catching up with old church friends...Kelsey & Jon, Twon, Jamie, The Spencers, Brian. There were many people who we sadly didn't have an opportunity to see. Hopefully next time! The kids getting pink eye. The kids throwing up in the car on the ride home. Plans being canceled due to an ice storm...I would have been fine if it were snow! Julian jumping into the tub fully dressed. Worrying about stairs at both grandparents houses. We don't have stairs in our house, and I was completely paranoid about the kids tumbling down them and breaking their neck.